Next to Lisbon, Porto is the second largest and most significant cities in Portugal, both as to economic activity and cultural life. However rough the rivalry between these two cities might be, Porto is far from being deemed a mimicry of the capital city of Portugal; on the contrary, it has a rather unique personality which has long been world wide ascertained both by locals and visitors. Porto has yet another feature to take pride in: it blends into a single expression the historic heritage – which is why the old center of the city was declared a World Heritage Site – and the liveliness of the many establishments which enable the most pleasant way of spending the spare time. In addition, Porto can take pride in being the one city which inspired the conception of the name of the entire country (Portugal from Portus Cale, as Romans used to refer to it in ancient times). The origins of Porto date back to ancient times, but long before Romans conquered the place, Celts are said to have inhabited it, hypothesis substantiated by several archeological findings. Moors have also left their print on the place, but England too had its moment of glorious dominion over Porto. 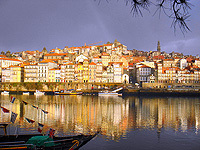 However, it was not until the beginning of the 20th century that Porto became part of the Portuguese Republic. The camping site Prelada is the most popular establishment of this kind among budget travelers, despite its main downside of being situated about 4 kilometers from the center of Porto. On the other hand, the center of the city is replete with accommodation solutions provided by numerous hotels, may them be mid or high rated. Most of them are located alongside the famous streets of the city, which offers tourists the possibility to get really quickly to the main attractions of Porto. Tripe is, in terms of cuisine, not just the basic ingredient for the famous tripe stew or soup of Porto, but a tradition which goes back to the Middle Ages. On account of the fact that tripe has been so long popular among locals, the inhabitants of the city are called tripe eaters. Thus, tasting this local specialty might be considered a gastronomic must. The little french lady (or francesinha, as the locals call it), as well as the bacalhau bring their contribution to the culinary picture of the place. All in all, eating in Porto is quite an experience, given the fact that the many eating venues in the cities are among the best restaurants in the entire country. The Port wine may come in hand in order to wash down the reach meals offered by the city. The historic center of the city is in itself an attraction. However, in order to get to it, one might just as well visit the Ribeira, which is a riverside promenade hosting a few important landmarks, such as the Bolsa Palace (nowadays hosting the Stock Exchange), the San Francisco Church (beautiful Gothic work), or the Caso de Infante. The Porto Cathedral is said to be the oldest structure. The Avenida dos Aliados, the Cordoaria, and the Boavista represent further landmarks or areas of the city bristling with attractions. Despite the fact that Porto does not excel in terms of museums, certain valuable establishments of this kind should be mentioned: the National Museum Soares dos Reis, the Portuguese Photography Center, the Museum of Contemporary Art, the Port Wine Musem and the Tram Museum. The Lello Bookshop is also an interesting objective, since it is one of three finest bookshops in the world. A series of musical and film festivals are held in Porto, of which the Fantasy Film Festival, the Festival of Celtic Music, the International Theater Festival of Iberian Expressions, the Festival of Portuguese Rock and the International Folk Festival are the most notable. St. John's Festival, on the other hand, is, perhaps, the most strange since it implies the hitting of people on the head with plastic mallets; yet, it is the most popular event among locals, along with Queima das Fitas.